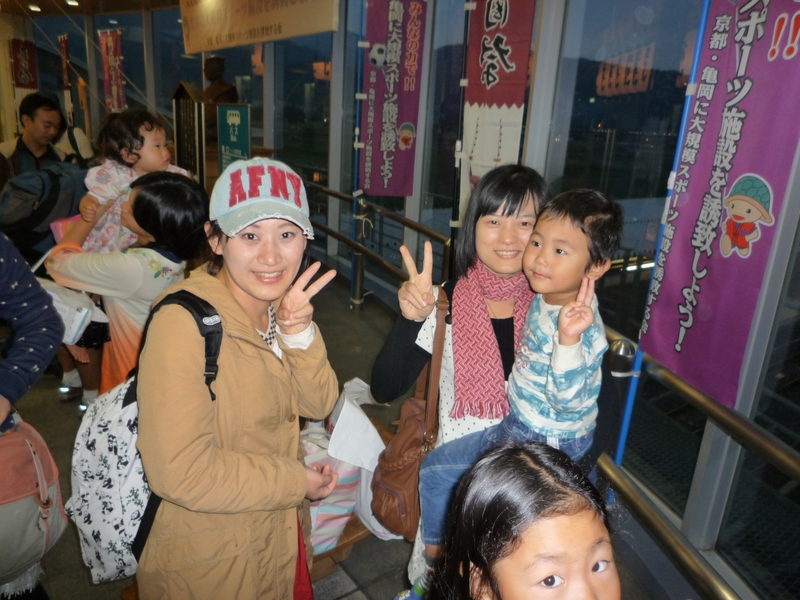 Hi everyone, this is Margaret from Kameoka. 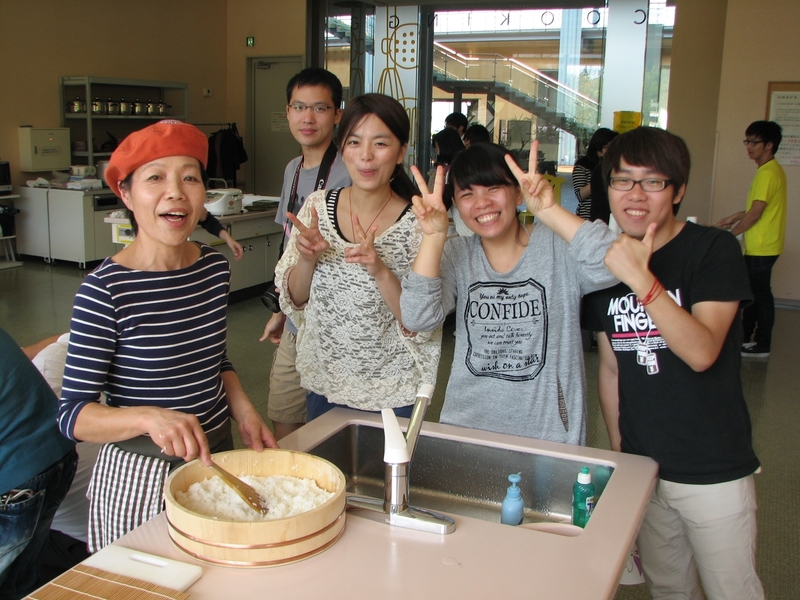 On October 13th and 14th, the Lifelong Learning Foundation, Kameoka held the annual “Look Around Kameoka Tour,” a one night homestay program for study abroad students in Kyoto Prefecture. 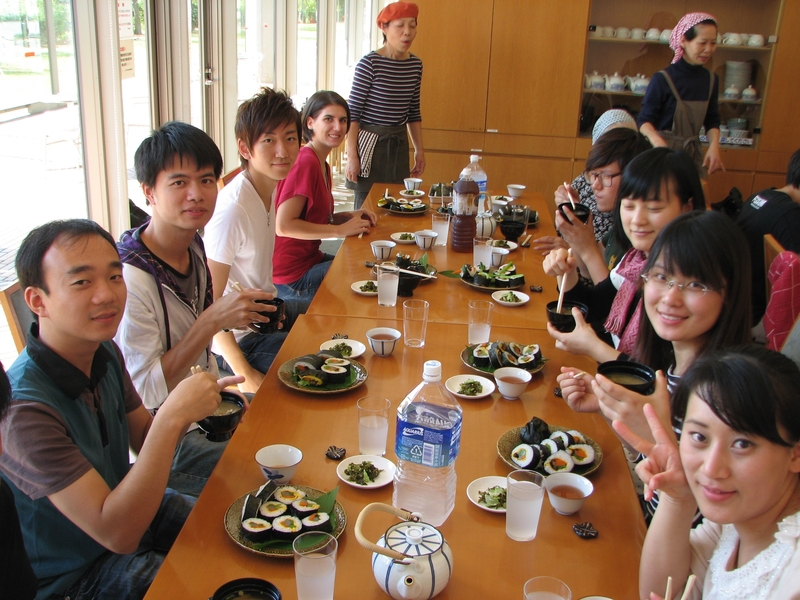 This year 15 students from 4 different countries came and experienced Kameoka, many for the first time. This tour is a great opportunity for students in Kyoto to get out of the city and experience life in rural Japan. We met at Kameoka Station and then traveled by bus to the Yume Cosmos Garden in Yoshikawa-cho. Every year this garden is painted with colorful cosmos flowers, and people come from all over Japan just to see them. The garden overflows with more than 8,000,000 flowers of 20 different varieties, all with unique shapes and colors. Each year the city holds a scarecrow contest and different groups create their own scarecrow that visitors can vote on. There is even a special marketplace where different stalls sell homegrown vegetables and famous foods from the Tamba region. After the garden, we visited the Galleria Kameoka, where we learned how to make makizushi (sushi rolls). There is a restaurant called Shikisai in Kameoka, where a different chef each day uses locally grown vegetables to create healthy lunches. Three of the Shikisai chefs taught us how to make sushi. First we helped to cool the rice with fans after they added the concoction of sugar, salt, and vinegar to make it sushi rice. Then we learned how to put the ingredients together to make a sushi roll. They showed us how to properly place the sheet of nori on the maki sudare so it would roll with the grain. Next we spread the right amount of rice onto the sheet of nori and then laid the egg, shiitake mushroom, carrot, and komatsuna on top before rolling it up. It was harder than it looked, but in the end all of the students had made a delicious looking sushi roll. Then the chefs taught us to make temakizushi, which is something you can make by rolling up the ingredients into a cone shape with just your hands. The most exciting thing for me was watching the students interact with each other. They all come from different countries and different schools, but they are all here studying Japanese so they have that common language that brings them together. It’s quite interesting to stand in a group where the members are from China, Korea, Thailand, and America, but we are all communicating in Japanese because that is our only common language. 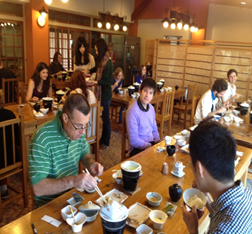 After eating, the students met their host families. 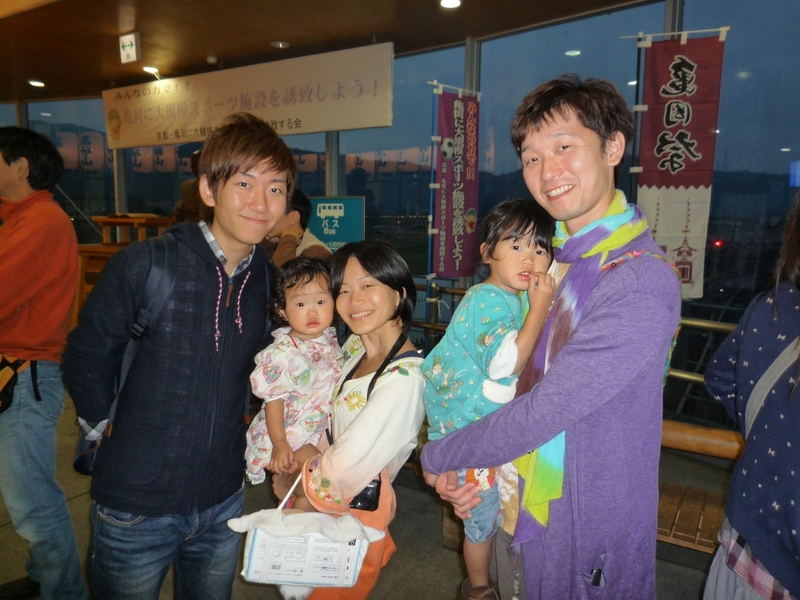 They spent the night in Kameoka and spent all day on the 14th with their host families. Then, at 5 pm they were dropped off at the train station to return home. Hello everyone, it’s Mark from Kyoto Prefecture’s International Affairs Division. 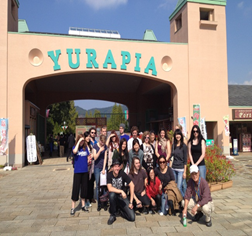 I’d like to write a short something about a recent field trip on which I went! 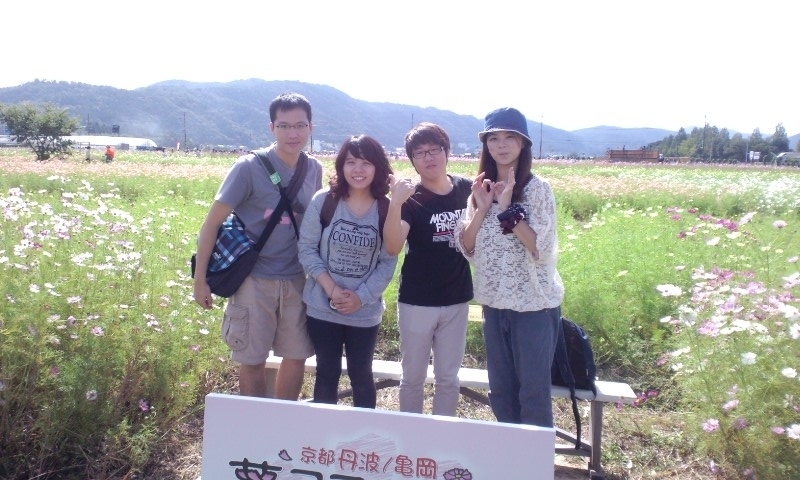 On Saturday the 20th October, I was asked by my office to help out on a field trip that Kyoto Prefecture was jointly organising, in cooperation with Kyotango City and their international exchange association. As the field trip was for Kyoto’s Sangyo University exchange students, they asked me to come along to help with things like translating and interpreting. It was a really early start on Saturday morning, getting picked up by the bus from the Prefectural Office at around 8am, to start the long drive up to Kyotango. The atmosphere on the bus was an odd mix of sleepiness and excitement for the weekend ahead. After a brief stop on the way, we eventually arrived in Kyotango around 11:30am, and after a few opening and welcoming words, we got straight to work on producing handkerchiefs. We were given paints and stencils, and everyone seemed to enjoy themselves, despite a couple of the students not perhaps getting the end result they were hoping for! I was very proud of my 95/100 score given to me by one of the ladies teaching us. Afterwards, everyone was very hungry, and so we had lunch nearby. 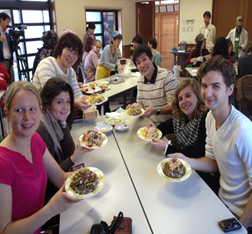 We were taught how to make bara-zushi, and everyone made their own, piled high with rice, fish, and egg. We were also served local bonito and soup, for a typical Kyotango meal. 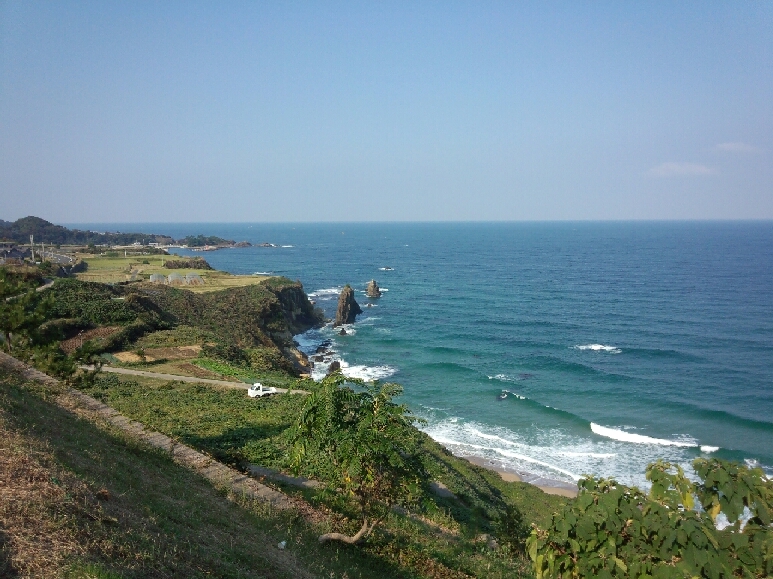 The next part of our busy schedule took us to the centre built to protect and promote the Kotohiki-hama beach. 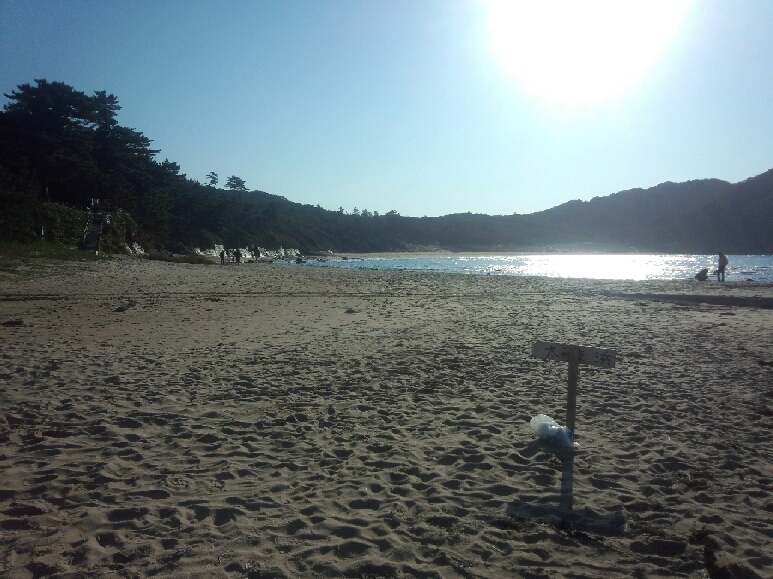 This beach is special because its sand is so clean, that it makes a sound, somewhat like the koto, when you walk on it. After an explanation and a chance to make decorative candles with the sand, we all had a chance to go down to the beach and experience the beach and the stunning view of the sea for ourselves. Eventually we headed over to the hostel on the coast, where we all kicked off our shoes and had a rest from the busy day. Before the fantastic dinner, we were visited and given a few short words from the vice-governor of Kyoto Prefecture, the mayor of Kyotango, and the head of the local international exchange association. We were also very happy to receive a few bottles of local sake for everyone (over 20, of course) to sample. The rest of the night was spent relaxing in the hot springs of the hostel, and getting to know each other over some of the delicious sake. The next day was another early rise, and after a traditional breakfast, with some of us feeling a little more fragile than others, we headed out early for the second day of a busy schedule. Visiting the local Eco-energy plant, we got to see Kyotango’s environmentally friendly power plant in action, before heading out to the local fair. There we were able to sample plenty of delicious local food, see various performances on stage, and for some of the group, dabble in some bargain shopping! After a sleepy journey back through a traffic jam, everyone made it back safely. I hope everyone had a good time, as I enjoyed myself a lot! It was a really great chance to, not only see part of Kyoto Prefecture that’s so different from the City itself, but to meet other exchange students and people my own age. I hope we all keep in touch and go on another field trip again soon!